When I started attending craft shows, I would admire the work and creativity that people had put into their handmade quilts. Some I would just love, while others that looked like they had had every quilting technique thrown at them left me with a whopping big WTF expression on my face. 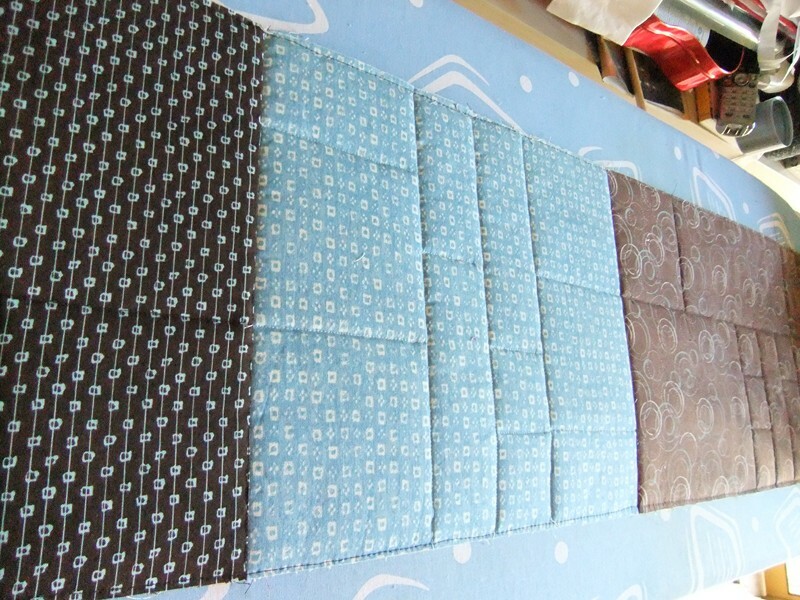 For many years I would admire, but never aspired to make my own quilts. It is just another “craft” that I don’t need to get involved in because it comes with too many ‘accessories’, and to have the quilt professionally quilted is just way out of my budget. A couple of years ago, Monica Poole released a few quilt designs that use a ‘quilt as you go’ technique which I have become fascinated by. I have bought two of the patterns for that day when I will have ‘time’ to sit down and make them. They don’t require me to buy any new equipment or special templates! WOO! In the meantime, though, I found a pattern that I just had to try out. It appeared in Patchwork & Stitching Magazine (Vol 11 No 2 – 2010 Annual), and jumped out at me as an easy project to cut my quilting teeth on. 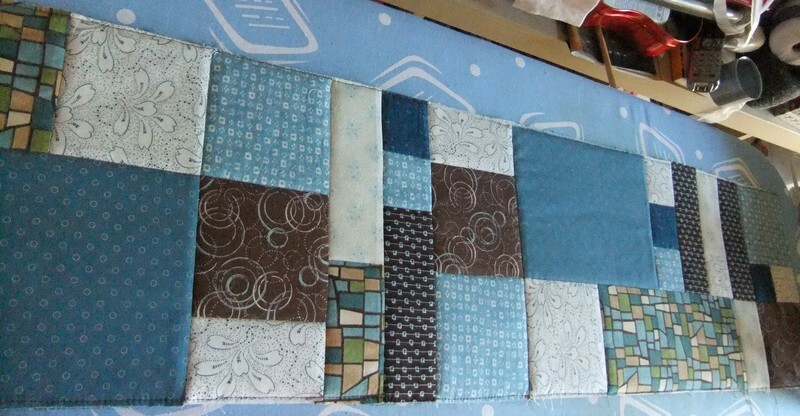 It isn’t a “Quilt as You Go” project, but it’s also not a large project. 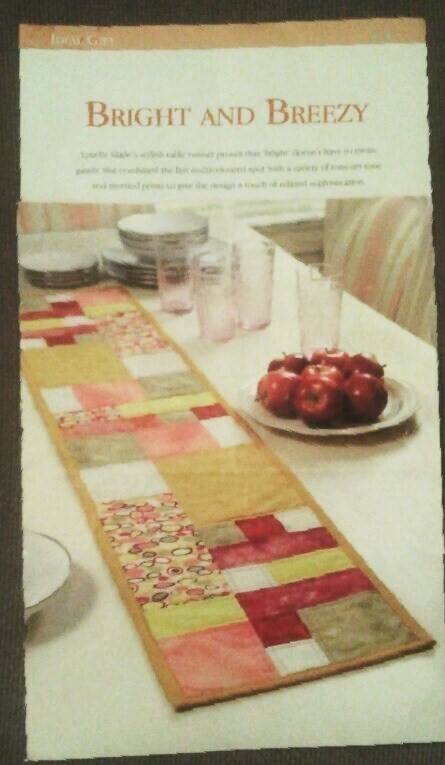 It’s called “Bright and Breezy”, and it is a quilted table runner. The example in the magazine was bright springtime colours of yellow, pink, red and green. These are NOT my colours. I thought that in the right colours, it would be a great gift for my parents for Christmas. Ambitious, much? First thing I had to do was decide on a colour scheme. Thankfully this was the easiest part of the whole project. They have a Kingfisher blue feature wall in their dining/kitchen area. So teaming that with a brown and off white pallette, I think it came together really nicely. This pattern called for a lot of fat eighths, which are not that readily available in Australia, so I bought 30cm to cover myself. This ended up being WAY too much fabric. Next time I will make paper templates of the pieces that need to be cut so I don’t have a bunch of wasted fabric. Thankfully I was able to make use of some of it as the backing. 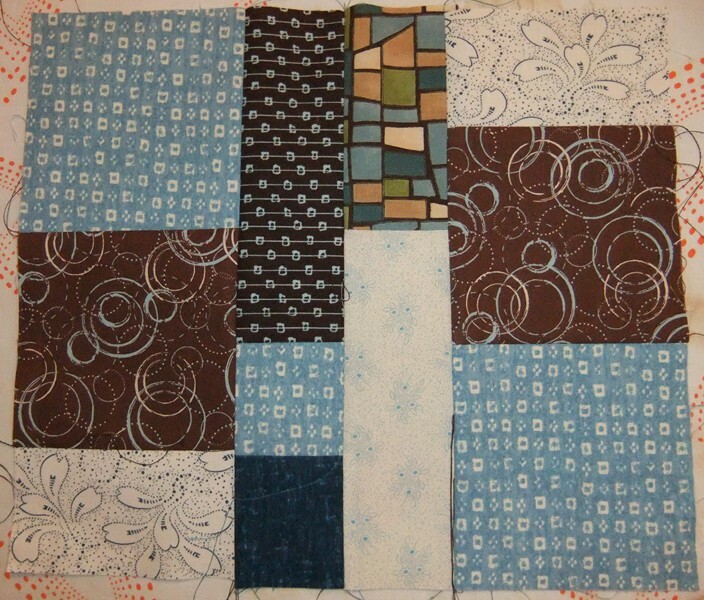 Following the instructions, I cut and placed, pieced and pressed. I was ever so careful with the 1/4 inch seams (thankful that my machine has a 1/4 inch piecing foot), and worked my way through all the pieces. I was surprised at just how easy it was. Because I had so much fabric left over from the front pieces, rather than buying another piece for the backing, I pieced three together, that reflected the three sections of the front. Matching the seams front to back was a bit tricky. It’s not perfect, but then, I’m not entering it into a show. Working the actual ‘quilting’ part was easy. I decided to stitch in the ditch rather than the 1/4 inch away from it as per the pattern, as I thought that in this case, it would take away from the materials that I’d chosen. The binding wasn’t difficult, but mitred corners are fiddly and a little tricky. And let’s not forget the endless hand stitching to finish it all off! I think it came out beautifully, and the best bit is, my parents just loved it. It now lives on their dining room table (as was my hopeful intention). oh that’s very effective. I could do that! I’m sure!